The Collins MM-1 is a 22 ounce(nearly 2 pounds) PTT(push to talk) dynamic microphone designed to fit in your hand comfortably. This microphone has been engineered for maximum voice response. 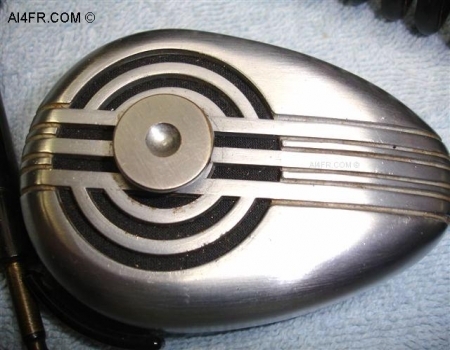 The microphone has a die-cast case which is finished in a brushed satin chrome. A neat feature of the MM-1 microphone is the location of the mounting button which is on the front. 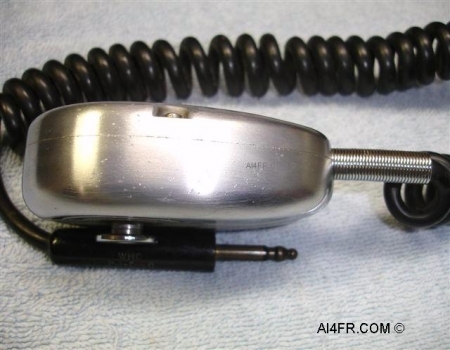 When the MM-1 is removed from its resting bracket, the microphone is instantly in position for transmission. The MM-1 is supplied with a five-foot length of coiled cord. The MM-1 has a frequency response from 200 to 10,000 cycles per second and has an output level of -48 db. 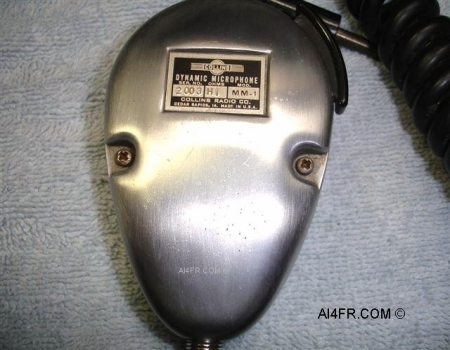 This heavy hand microphone features a 3/8 inch plug and was made in Cedar Rapids IA. 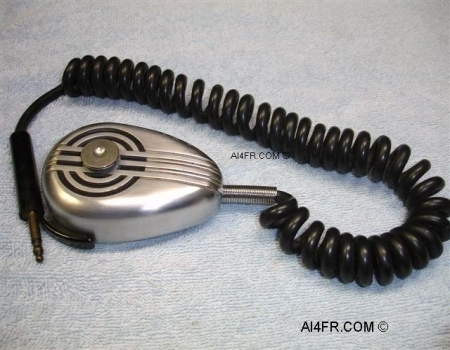 The photograph on the left is a picture showing the quality of construction of this hand microphone. Here we can see the craftsmanship that went into fitting the upper and lower pieces of the metal case together. The photograph on the right is of the back of the microphone. Here we can see the metal sticker in place with the Collins logo on it. The sticker also reveals the serial and model number as well as the impedance of the microphone.